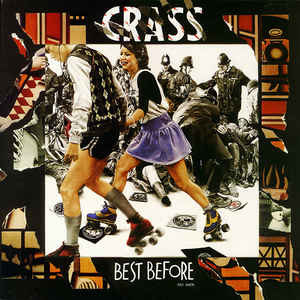 Best Before 1984 is a compilation of Crass' singles and other tracks, originally released in 1986, including lyrics and a booklet ("...In Which Crass Voluntarily 'Blow Their Own'") which details the history of the band in their own words. The record brings together controversial tracks like Reality Asylum (in an alternate, extended version to the original album edition), Sheep Farming In The Falklands and Do They Owe Us A Living? - the last ever performance at the band's last ever gig in 1984 at a Miners' benefit concert in Wales. The album was named in reference to the notion that 1984 was the band's "'sell by date", the year that they had often publicly stated that they would split up. Indeed, the band ceased gigging and recording in that year.